Back row, from left: H. Elmes, Radio Operator; J. Chauvin, Crew Chief; R. DeKay, Tail Turret Gunner; E. Gibson, Top Turret Gunner, T. Fasone, Waist Gunner, and M.Ostergaard, Nose Turret Gunner. 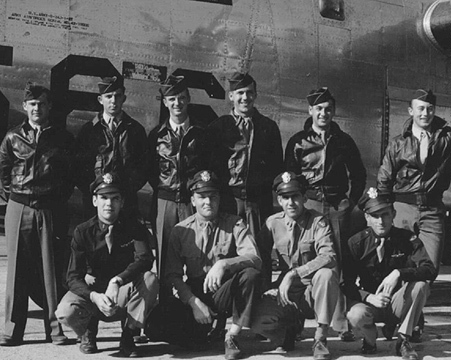 Front row, from left: R. McJones, Pilot; E. Glenn, Co-pilot; A. Harbelis, Bombardier; R. Cerrutti, Navigator. I was a member of the 72nd Squadron. My missions began from Morotai, the first was to Palawan on 15 Dec 44. During January and February 45, we flew many missions to Luzon, Negros, and Corregidor with occasional trips to Borneo. In March, we moved up to Samar and most of our missions were within the Philippines; however, did go to Kuching, Borneo, on our longest mission, 15:10. My 41st and final mission was to Sibu on 24 May 45. 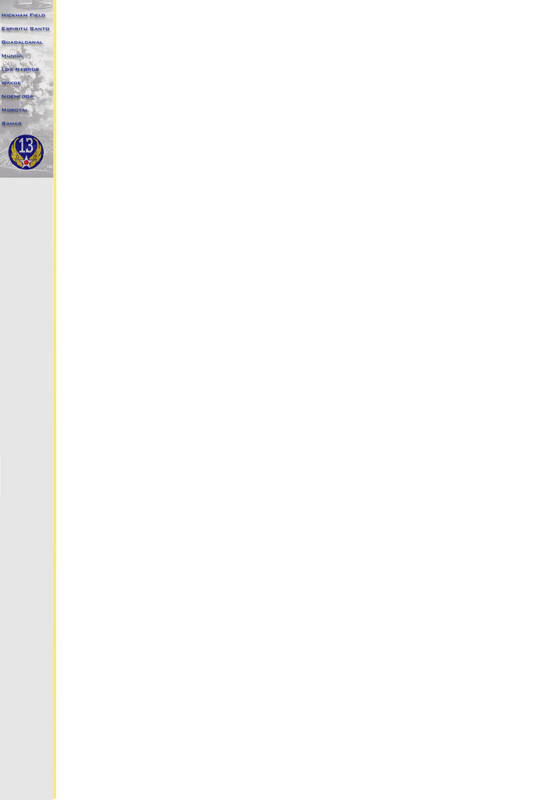 Cerrutti transferred to another crew early in our tour and was lost in a takeoff crash. I had flown an initial mission with an experienced crew, so my tour was completed one mission prior to the other members. 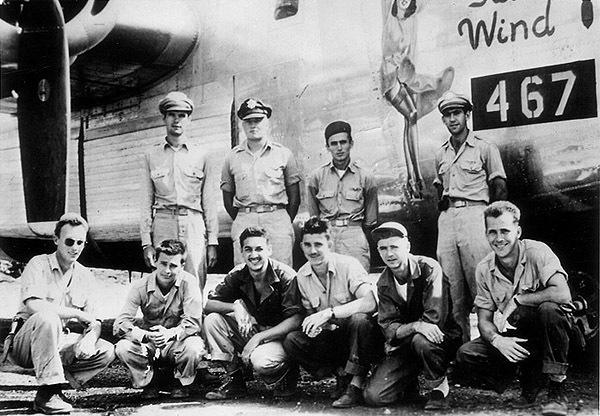 On their final mission, the B-24 in which they were flying experienced multiple engine failures over Brunei Bay off the west coast of Borneo. Elmes and Chauvin did not survive the bailout; after a few hours in the water, the other crew members were rescued by a PBY piloted by Warner Britton. "Britt" was a member of the 2nd Rescue Squadron, also part of the 13th AF, operating out of Zamboanga.